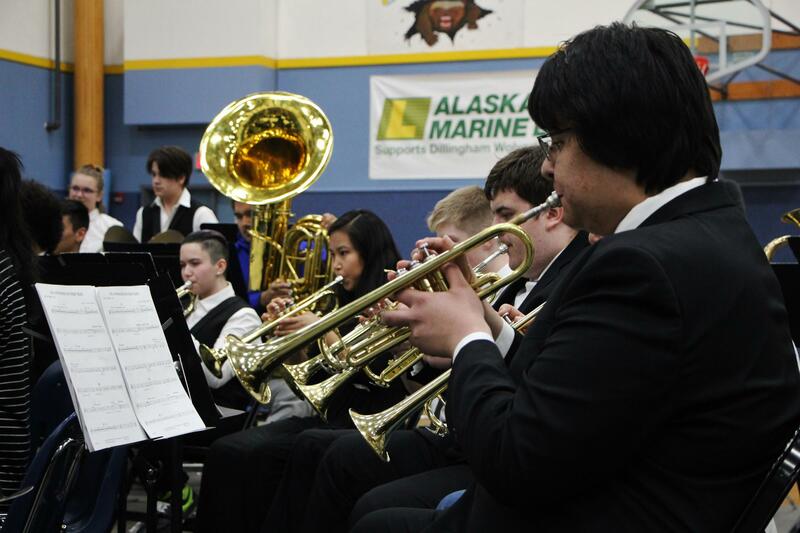 Five schools played and sung over two jubilant days of music for the 2019 Region I music festival in Dillingham. Musicians from Unalakleet, Bethel, Nome and Kotzebue travelled to Dillingham for two days of practice and performance. On the first evening, the bands and choirs from five schools showcased songs they had been rehersing for months. 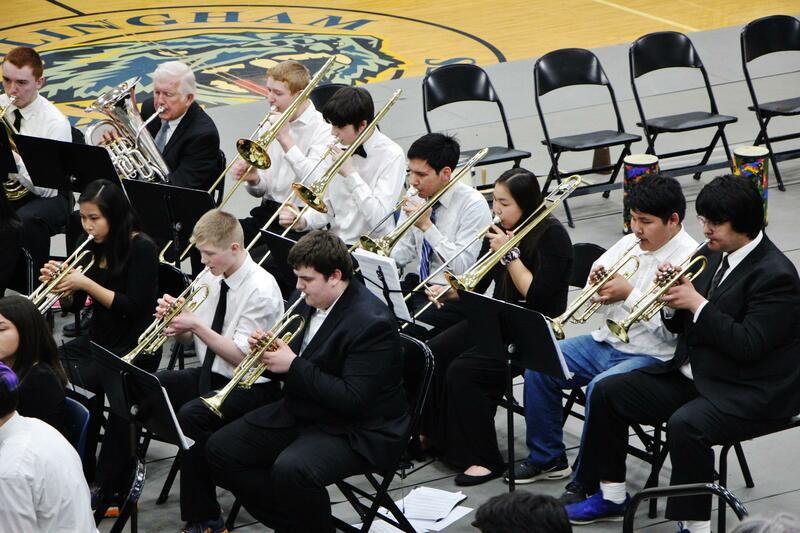 But the students' efforts culminated in the final concert on April 6. Students from all five schools sung as a single choir and played as one band. They had only one day to practice together. This year's final choir performance was conducted by Terry Hicks. Tracey Gibbens directed the band. Dillingham Music Director Brandon Smith opened the finale. “Good evening everyone. Thank you so much for coming here. We have had a fantastic weekend," he said to cheers and applause. "An awesome weekend to work with each other, perform with each other, learn a little more about each other. That's what it's all about, guys. This is the culminating performance." A few minutes before, Dillingham alto Clara Chapman was a little on edge; Saturday's finale performance would be different than the previous evening. "I'm nervous because last night we performed with only our choir, and tonight we're performing with everybody that travelled to Dillingham," she said. "Some of the people that come to Dillingham don't know all of the songs, so this morning we had to learn everything in one morning." During practice, the students also learned a few techniques. "A really important one is your facial expression," Chapman said. "So you have to make the crowd believe whatever it is you're singing. Another one is opening your mouth so that there's more space in your mouth, so that more sound can come out." “Making space in your mouth so that it stays nice and open and everything is nice and clear and very smooth,” she explained. Martinson is a soprano. She has sung in choir since her freshman year. Opera is her favorite genre, and during auditions for the state festival on Friday she sang Giacomo Puccini’s aria “O Mio Babbino Caro." “I really love the piece that I chose this year. It really touches me,” she said. Many different paths led the students to perform together last weekend. 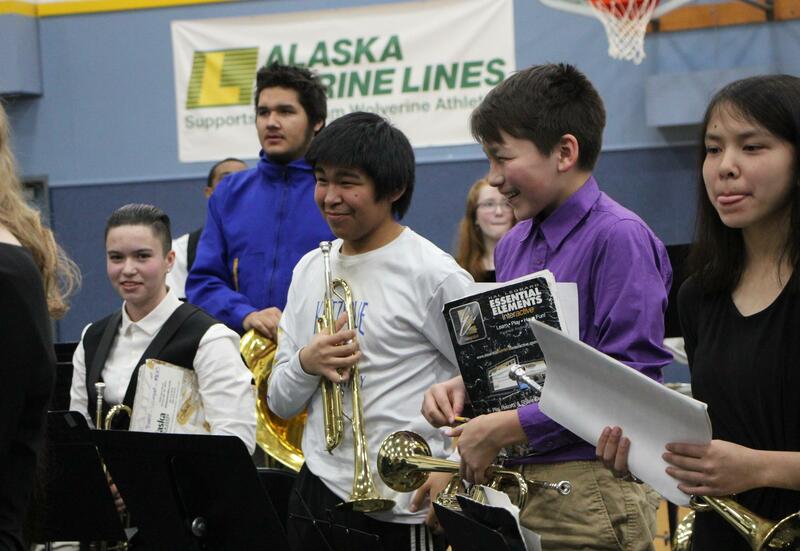 Trombonist Sawyer Sands, a Dillingham sophomore, has played for the past four years. Bethel sophomore Greta Whitney plays alto saxophone. She said that the short amount of practice time leading up to the final performance proved challenging. Like Sands, Whitney has been part of her school's band for four years. She said she has continued because it makes her happy. “It’s a little cheesy but being able to play all these cool sounds and these songs – that’s just an amazing feeling. Because I can make my saxophone sound however I want it to,” she said. 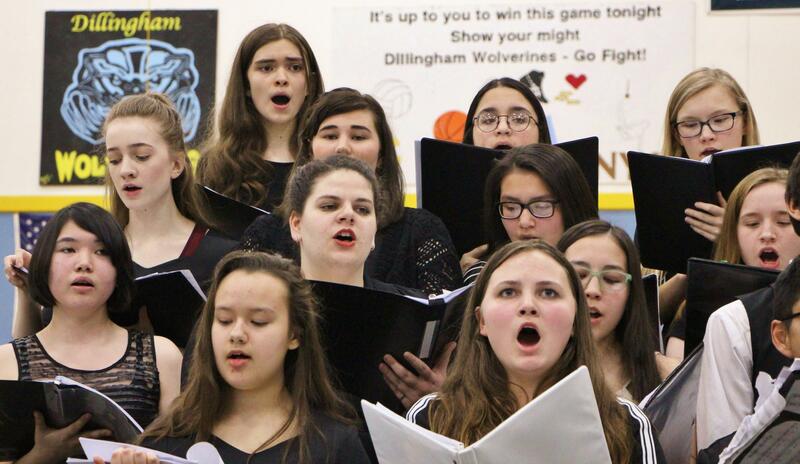 Soloists and ensembles auditioned for the state competitions April 5. Dillingham flautists Lotus Becker and Angelica Marx will perform their duet at that music festival in May. Marx will also sing a solo for the state voice competitions.